The merger has been reported by the BBC. 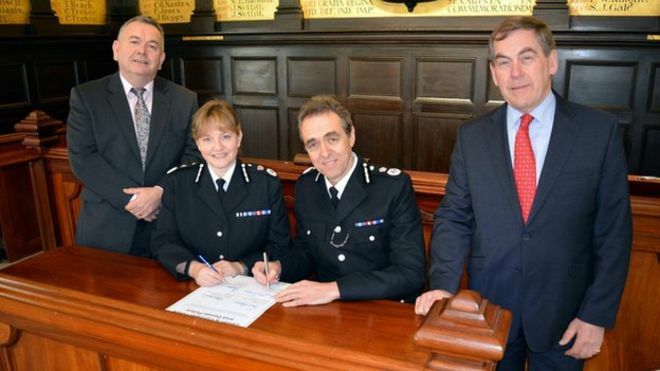 Julian German, Chairperson of the Cornish Constitutional Convention said: "This is making policing even more remote to the residents of Cornwall. There is a great concern regarding the reduction of policing in Cornwall and we do not believe this will help in any way. It will move the focus of policing even further to the east, past Exeter. "The Cornish Constitutional Convention recognise that there is reducing financial resource and there is a need to do things differently. However, the Convention have been promoting a Cornwall-based solution which draws the emergency services together. "By disaggregating the police and ambulance service and joining them with the coastguards and fire rescue service we can form a responsive Cornwall emergency service. By bringing back office functions together and co-locating the emergency services, an efficient emergency service can be formed whose focus is solely on serving the residents of Cornwall. "At the recent Symposium held at the Institute of Cornish Studies, we showed that London has much greater powers than a Local Authority, for example, over transport, policing, economic development, fire and emergency planning. If London can have control over its police, then why not Cornwall? The Cornish Constitutional Convention restates its desire to develop a fully devolved Assembly for Cornwall, that is fit for purpose, democratising Cornwall-based services and taking decisions with closer public involvement. "Give Cornwall the resources and responsibilities and it will deliver, not only for the people of Cornwall, but for the UK."